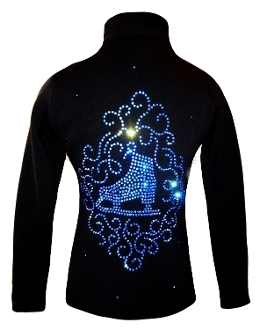 The Ice Fire BJ89 Polartec Fleece Figure Skating Jacket features a "Skate & Ornament" design made with apx. 400 superior machine cut Czech rhinestone AB Crystals. Very special and absolutely beautiful, this jacket will definitely be noticeable at the ice rink. Matches "Love & Skate" ice skating pants. Choose from several colors in Child XS - Adult L.
Ice Fire can take 4-7 business days for delivery.